Natsume Kiroemon, the 45th leader of the Natsume family, is due to inherit the Koryu no Mimi, also known as the Golden Dragon Ring, which gives its bearer easy access to wealth and women. As a result of his father’s death, he left the Italian monastery where he’d been training and rightfully took the name “Natsume Kiroemon” as well as the power of the Golden Dragon Ring. 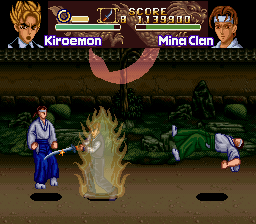 Upon his return to Japan, Kiroemon fell fatally in love with Kanako, one of the members of the rival Mina clan. 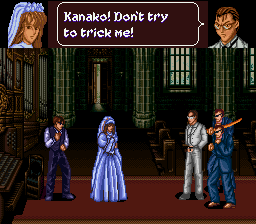 However, the evil hand of the Mina clan attacked Kiroemon and then abducted Kanako. Now Kiroemon has unsealed the power of the Golden Dragon Ring, making his own power surge, and he’s striking back at the Mina clan. Both Kiroemon and Kanako’s fate are in your hands! 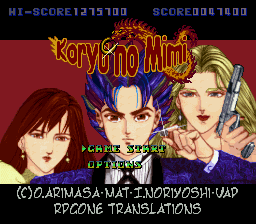 Koryu no Mimi is a side-scrolling beat-em-up somewhat in the same vein as Final Fight. 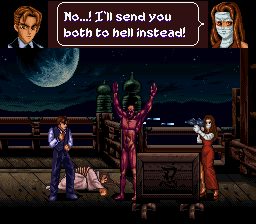 As Final Fight clones go, though, it seems pretty good. For one thing, the storyline is a lot more involved, with lots of different allies and villains running around. There are a lot of moves and combos you can pull off, and you also get plenty of weapons to wield, scenery to throw around, and so on. And if you can fill up your power meter, you briefly harness the power of the Golden Dragon Ring to become faster and much more powerful. Neat! 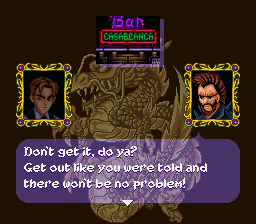 This is an English translation of Kouryuu no Mimi for the Super Nintendo.